This much anticipated annual release from Kidrobot’s most iconic figure is available now at CONCRETE. Last monday, the Concrete Image Store in Amsterdam hosted the release and press event for the Kidrobot and Swatch collaboration, six Swatch watches featuring prints from some of Kidrobot’s most celebrated artists, such as TILT, Joe Ledbetter, Kozik, Gary Baseman and Tara McPherson. 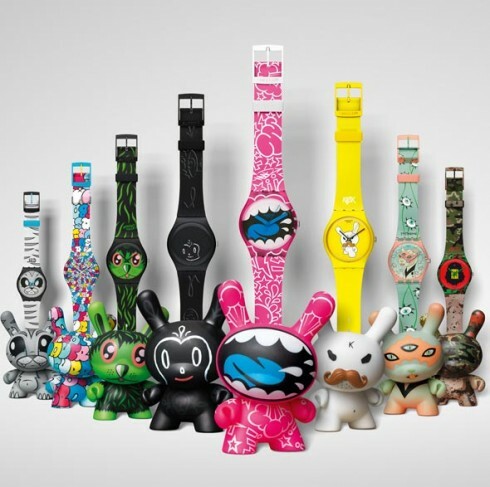 A total of eight watches have been produced in very small quantities and are all accompanied by a matching Dunny. Check out our picture report below. Acclaimed graffiti artist: TILT also made an appearance to work his magic on a 20″ Dunny and a Swatch Maxi Watch. Known for his bubble letter style graffiti, he started out in the south of france dropping his first tags on a local skate ramp, since then he has been ensuing his career and has been nourished and influenced by extensive travel. Inspirational journeys have seen Tilt exhibit and leave his mark as far and wide as the U.S.A, Hong Kong, Japan, Mexico, Thailand, Australia, New Zealand, Laos, Taiwan, China, Canada, Philippines, Indonnesia, Maldivians and in excess of 12 countries throughout Europe. All of the watches are available as of now, at Concrete Image Store in Amsterdam. Ooops. It’s happened again. Here’s a leaked look at Kidrobot’s upcoming Dunny 2011. The new series features pieces by 64 Colors, Aya Kakeda, Chuckboy, Dirty Donny, DrilOne, Elphonoso Lam, Huck Gee, Kronk, Le Merde, MAD, Mishka, MisterF®ame$, Squink! Travis Lampe and Betso. The lineup mixes Dunny stalwarts with Dunny 1st timers – a welcome approach. Looks like this series will feature a build-a-dunny chase, 1 piece included with each blind-box. Expect these at Concrete later this year. Our fellow toy dealers (and enthusiasts) from the States: ToyTokyo have released a commercial featuring a big part of their collection. Be@rbricks, Space Invaders, Barack Obama, Transformers, Don Corleone, the Joker, Mazinger, Dunnys and Michael Jackson all got together to have themselves a party. Loving it! Hell must be a swell spot, because the guys that invented religion have sure been trying hard to keep everybody else out. San Francisco-based artist, Frank Kozik, teams up with Kidrobot and Hello Kitty creator Sanrio to reimagine Japan’s coolest cat. The Empress, wicked in red and flashing fangs, forked feet and devilish horns, comes with appropriately malevolent accessories – a pitchfork and a spider sidekick. Available now at your local Concrete. The world’s greatest do-it-yourself toy just got shrunk! The geniuses at the Kidrobot labs have managed to squeeze Munny’s endless world of possibilities into a miniature, 4-inch frame. Paint, draw, or scribble; pierce, pose or clothe. Each Munny comes with stickers, practice template, marker and a mystery accessory, available once more at Concrete. Check out the slideshow below to see what others have already done with their Munny’s and click here for tips and tricks on customizing your own Munny.